If you like slot games with various wild animals, then Rumble Rhino Slot at Vegas Spins could be just what you are looking for. The game powered by Pariplay comes with 6 reels and 100 win lines. It has an impressive gameplay that features a diamond Bonus Round with a chance to pick up multipliers, free spins, and a cash prize. The game’s background resembles a village in the wild Savannahs with different wild animals roaming around. On the reels, you will find alphabets, wild animals, a Rhino Wild, and African Masks! Before starting the game, you will need to register an account at Vegas Spins. If you already have an account, then just log in to play the game. Once you’re done, head over to the betting section where you can adjust your bets. Use the + or – sign to choose the bets according to your likes. Next to the SPIN button, there’s the AUTOPLAY feature. This allows you to spin the reels without human intervention. However, you will have to pre-set the number of spins first. Click on SPIN to start. Bet Levels: Rumble Rhino Slot does not have any bet levels. 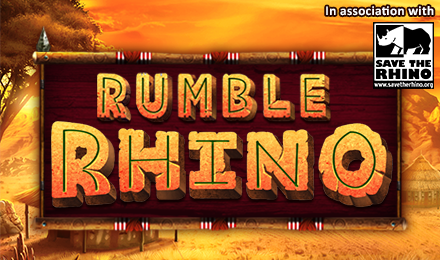 Amount of Paylines Selection: You will find 100 paylines in Rumble Rhino Slot. Coin Values: The minimum value is £1.00, and the maximum value is £50.00 respectively. The Rhino Wild has a payout of up to 5x the stakes. It will replace all the symbols on the reels, apart from the Mystery Mask Symbol and the Bonus Scatter. On Rumble Rhino Slot, there is the 4x4 Mega Symbols. Keep an eye on them since they are the highest paying symbols. These colossal symbols might come into view on reels 2, 3, 4, and 5 in the centre of the screen. The Mystery Mask Symbol appears on the reels with another symbol behind it. The symbol that it hides can be any of the game symbols apart from the Bonus ones. Note that on Rumble Rhino slot, the mystery mask symbols can also be the 4x4 mega symbol. All the masks reveal the same symbols on the reels. The only time you enter this round, is when you land Bonus Symbols on reels 1 and 6. It then brings you to another screen, where you will see 24 diamonds. You just need to click on them to reveal the hidden symbol. You will find different symbols that can trigger various features, such as free spins. However, it is activated if you match 3 of the same symbols.